Hopefully I'm posting in the right section. Anyway, I just wanted to point out that the Good/Bad/Conclusion part of your reviews are somewhat hard to read. I'm not sure of its just in the dark theme, but that particular section uses a white background with a gray font rather than black. I took a screenshot but I'm not sure if there's a way to attach images to this post via the AC app. I don't see an option anywhere. 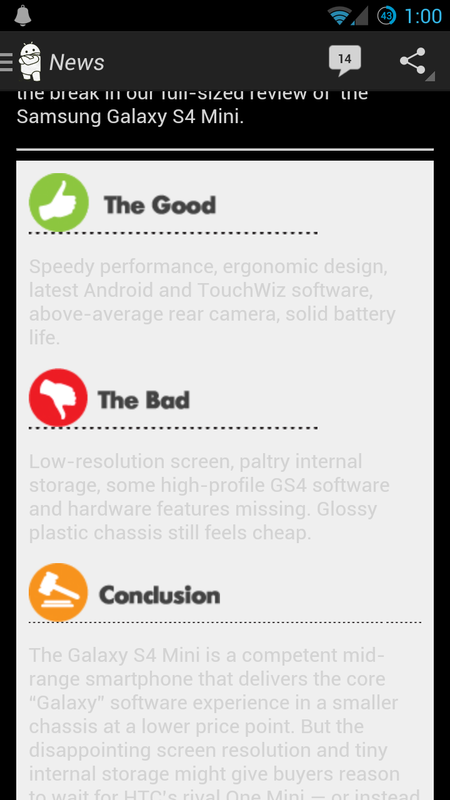 If you want to see what I'm talking about, go to the Galaxy S4 Mini review. It does that in the android central forums application too. I know, any reason why? Doesn't make sense to me, but I'm sure there's a valid "technical"reason! I meant to forward you the suggestion yesterday but completely spaced, lol. AC Charger makes a high pitch sound when connected, Is this normal?